We could use a hand. Or two. Or twenty. 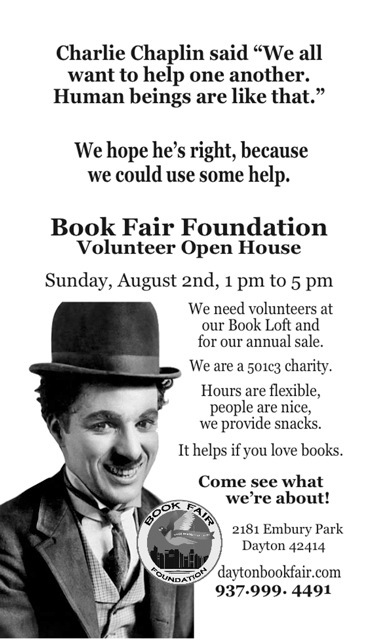 And to that end, we’re hosting our first ever Volunteer Open House on Sunday, August 2nd from 1 p.m. to 5 p.m. Come on by and see what we’re about. 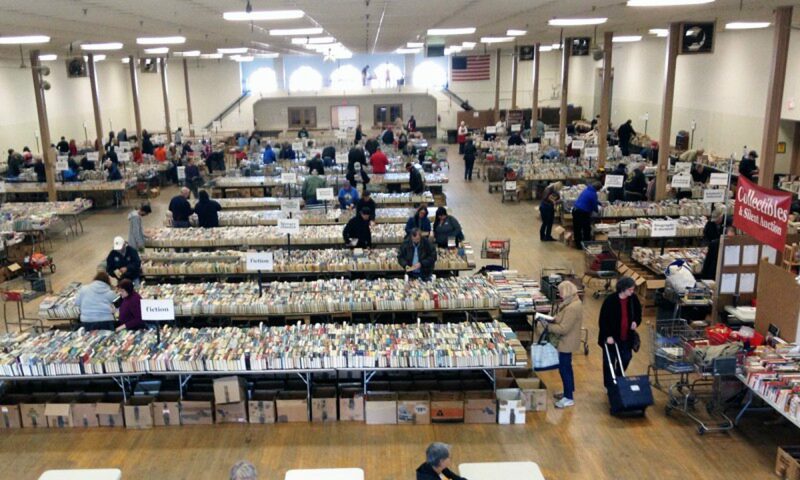 Volunteers are needed for both our year-round Book Loft and also to help staff our annual Book Sale, November 13-16 at the Montgomery County Fairgrounds. We have all kinds of different things for folks to do, and of course, it really helps if you love books. See more about specific opportunities for volunteers by clicking here. Our hours are flexible, we have some off-site volunteer opportunities, the atmosphere at the loft is, um, bookish, and pleasant, and we provide snacks. Our current volunteers range in age from 20 to 92, and we are united in our love for books. We understand that you might be a little shy about just ringing up to volunteer, so we thought we’d have a little party so that potential volunteers could come see how we operate and what it is we do. We are a 501c3 charity. This year our sale benefits the Human Race Theatre Co, the Aullwood Audubon Center and Farm, the House of Bread Community Kitchen and the Humane Society of Greater Dayton. If you’d like more information, feel free to give us a call. 937.999.4491. We need volunteers year round at our offices/book loft and we also will need volunteers for our annual sale— November 13 through November 16. We’ll be posting more information about volunteering for the sale in October. You’re always welcome to drop by the loft during any of our open hours (Tues, Thurs and Sat 10-3, Wednesdays 3 to 7) and we can tell you more about it. Previous PostPrevious We Priced a Ton of Children’s Books! Next PostNext Time for Another Round-Up!